Today I’d like to share how we transformed our digital workspace in 2017. Together with our partners we have gathered a lot of market feedback. We have discovered what companies and humans need to simplify their work. Below I will share some of the most important features we’ve added to Workspace 365 over the past year. Many companies are researching the move to Office 365, but a lot of companies face difficulties with moving their file server to a cloud based document app. Sometimes they have too much data on their file server, or they still need it because it is linked with tailor made software. 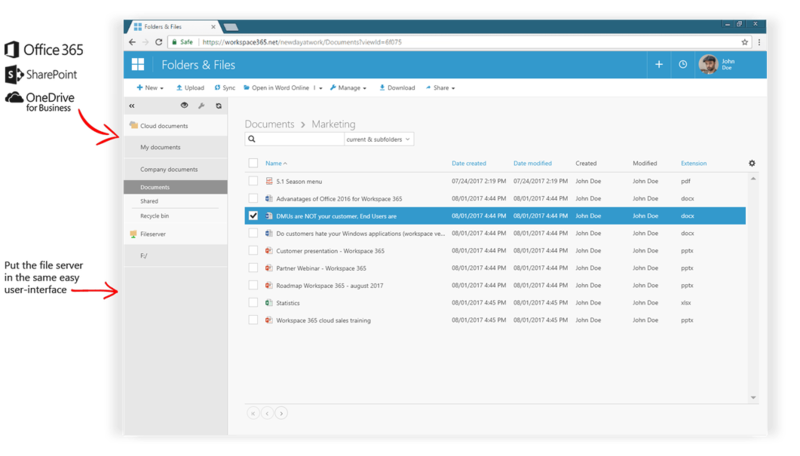 That is why we integrated the file server within our document app in the digital workspace. By doing this, your employees can open all their documents from Office 365 or their file server within one document app. They can use the online Office editors to work on their files and easily attach the files to emails. As documents are still very important to most companies, we made huge improvements in our document app. By simplifying our document app, people can use it without any training. This year we added the possibility to select which SharePoint teamsites you see within your document app (for non-techies, which folders you see). Next to this, we now allow you to move folders and to search within subfolders. In 2017 sharing files via links has become popular. People seem to realize that this prevents having twenty versions of one document. That is why we have made it super easy to share your files via link directly from the document app. It is very clear that Windows applications are transforming to cloud (web-based) applications. That is why many companies are moving their IT completely to the cloud. For new companies this is very easy, they can start with 100% cloud based software. However, as an existing company you might face a transition period moving from a traditional IT-system to the cloud. As we all know that innovation should happen quickly, we have made it possible to create a bridge between the old IT-world (file servers and remote desktops) and the new cloud based IT-world (web-apps and Office 365). With our digital workspace, Workspace 365, we’ve made it possible to open your Windows applications within the browser on any device. You don’t need a client or extra sign-in. This makes it easy to open all of your applications with just one click and no need for any installations or updates. You can open multiple hosted applications in different tabs and work wherever you are. The Workspace 365 Business Apps have been around for a long time. 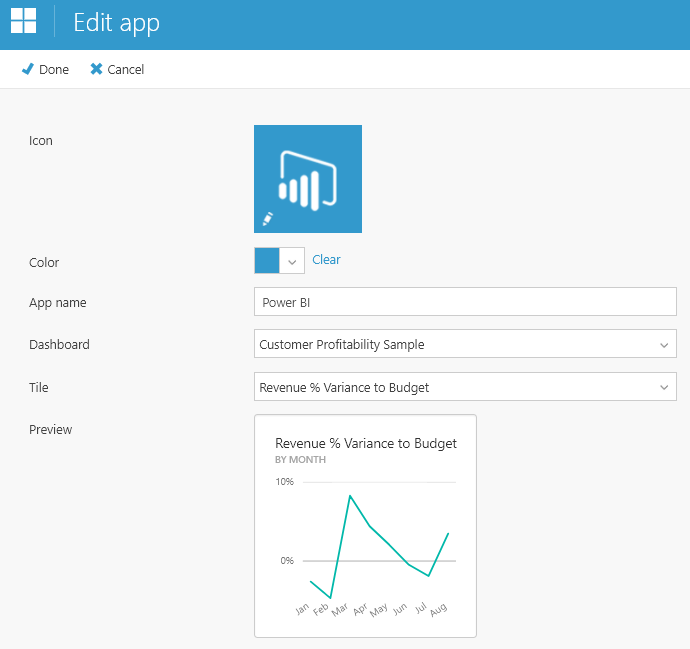 However, this year we created an API to push data from third party applications to the Workspace 365 Business Apps. This makes it possible to connect it with third party software, allowing you to create your own simple Business Apps which work on any device. In addition, we’ve created an overview builder. This gives you the power to select which data you want to see in your overview. Companies are looking for a safe and efficient digital workspace that integrates with their current software. That is why we keep adding applications which are supported for single sign-on. This way users only login once (multi factor authentication is optional) to access all their applications with one click. Discover which applications we support with single sign-on or request your application here. A lot of companies have valuable data that helps them to grow. Since this year you can integrate your Power BI live tiles. This helps you to show data to your employees on a daily basis. For a company owner this means that you see the revenue on your dashboard, whilst a digital marketer might see the amount of website visitors on their dashboard within their digital workspace. These are just some of the product highlights of 2017. Next to improving the digital workspace, we have welcomed many great partners and awesome customers. We started with making videos about the digital workspace, our customers and partners and we’ll share more of them in 2018. So, there’s plenty more to come in 2018, but for now we wish you a happy new year! Do you have any questions about the demo, Workspace 365 or do you have feedback for us? Contact Mark! Don’t miss anything, connect on LinkedIn!